Island tours with a twist! Island Jet is available for private charters and is a fantastic touring option for groups of up to 12 people. Experience a one hour exciting offshore jet boat ride through the iconic Whitsunday waters, zooming at high speed with amazing sightseeing thrills and spins, spread out over a 40 kilometre journey of pure adventure. This extended 60 minute jet boat ride incorporates the beautiful waterways of Airlie Beach, South Molle Island and Daydream Island, all in one tour. 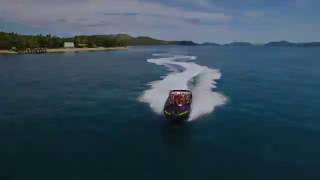 Board the mighty Island Jet Boat and travel through the pristine waters of the Whitsunday Islands, surrounded by tropical island resorts before heading into the Whitsunday Passage where the tricks and stunts continue. This exciting offshore jet boat experience offers fishtails, spins and slides while enjoying the stunning Whitsunday scenery. Catering for small personalised groups of 12, Island Jet Boating offers a must do Airlie Beach adventure. Island Jet offers private charters for groups of up to 12 people. Experience a one hour exciting offshore jet boat ride through the iconic Whitsunday waters, zooming at high speed with amazing sightseeing thrills and spins, spread out over a 40 kilometre journey of pure adventure.